Home»How Does A Torsion Spring Garage Door Work? How Does A Torsion Spring Garage Door Work? You know that when you push a button on your opener the garage door goes up and down when you press again. That’s the extent of most people’s knowledge of garage doors, but there’s so much more that you need to be aware. Eventually, the garage door is going to fail. If you don’t know about torsion springs and other elements, you’ll end up paying way too much to have it fixed. Your garage door is a workhorse, but eventually it wears down and it’s important to know how it works. We’ll discuss the garage door opening system and how the torsion spring and other components fit in. Your average garage door system is made from four primary parts: operator, tract, torsion spring and the door. Each of these are vital to the operation of the garage door and if any of them fail, then you’ll need garage door repairs to get it working again. The operator contains the motor and connects to the railing. When you press the button on your garage door opener, it sends a signal to the operator. It then turns on the motor and begins raising the door. The door itself is heavy and the motor itself doesn’t do the bulk of heavy lifting. At the top of the door is a torsion spring that is would tight when the door is closed. As it unwinds, it helps push the door upwards. When you close the door, gravity helps bring the door down and the chain tensioner recoils the spring for the next lift. The track system includes the primary tracks that pull the door up and down and the track containing the pulley and cable that actually do the pulling. This is your garage door system. When anything happens to a part of that system, you’ll likely need garage door repair. Time impacts everything and eventually your garage door system will need repair. The good news that most of the problems you can handle on your own and avoid the increased cost of hiring a professional. Below are a few common problems you can fix yourself. The one part of the garage door system most likely to break first is the torsion spring. The constant winding and unwinding can lead to the spring breaking or stretching out to the point where it can’t lift the door all the way. If the spring breaks, the door won’t go up at all. You can purchase torsion springs from us and fix it yourself. The operator does a lot of work. The heavier the door, the more work it must do. Much like the torsion spring, time can cause the motor to malfunction. If you know anything about motors, then you might be able to fix it, but if not, then you might want to buy a new operator. If the operator motor works and the torsion spring is fine, then the problem is likely the track and pulley. Every garage door has an emergency release cord. If you pull it when the garage door is closed, then you should be able to easily and smoothly pull it up along the tracks. If not, the there is problem with the tracks. A car hitting the door, earthquakes and many other problems can cause the tracks to misalign or it could be a problem with the pulley cable. These are repairs you could do yourself. Do You Need A High Cycle Torsion Spring? Springs are not invincible. If you open your garage door more than a three times per day, then you might want to consider a high cycle torsion spring. These springs are stronger and last longer than traditional torsion springs. They can typically handle 20,000 cycles for your garage door. 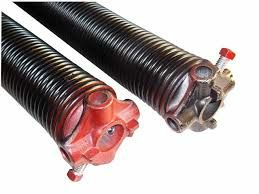 If you use your garage door a lot for commercial or residential use, then consider getting a high cycle torsion spring. It may seem difficult to fix your garage door assembly, but with the right tools and the right instructional videos, it’ll be a snap. Check out our videos on replacing torsion springs and you’ll be opening and closing the garage door in no time.